The vote goes to fantastic! X's two!! While planning the menu for a wedding I catered last month (more on that later) I chose two cookie recipes from my trusty Pinterest account. I chose the first recipe because I wanted to make color themed cookies. The original pin was to make Grinch Crinkled Christmas Cookies. I adjusted it to make Color Themed Wedding Cookies, and later adjusted it again to make Lemon Drop Cookies. All of the adjustments are listed in the recipe at the bottom of this page. I used a cookie scoop instead of two spoons, it just seemed easier. 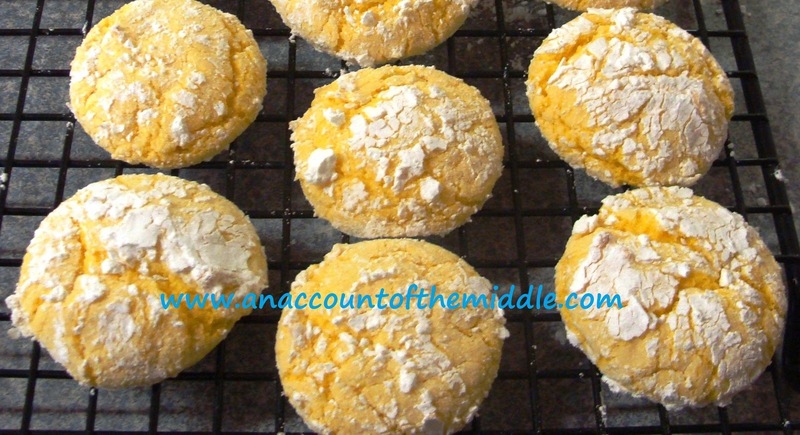 Since I used a cookie scoop I didn't have to roll them into balls after they were covered in powdered sugar. Be careful not to over bake them. I chose the second recipe because I thought it would be a nice cookie for a wedding reception. I had originally thought I might use chocolate hearts but in the end just used the kisses. On another note, most kiss cookies are a peanut butter cookie base. I HATE peanut butter cookies and therefore refuse to make them. It took me a little while to find the recipe I wanted, but it was totally worth it. The original pin was also for Candy Cane Blossoms. I adjusted the color out of this recipe, and then later replaced the kisses with peanut butter cups. Don't judge, it really is different than a peanut butter cookie! I used a cookie scoop for these as well. It will take a while for the chocolate to harden back up, so I don't recommend making these cookies if you don't have time to let them set. Preheat oven to 375 degrees. Mix powdered sugar and cornstarch together, set aside. Mix melted butter, cake mix, and eggs together until well blended. The dough will be stiff. Add in food color and stir until completely blended. Use a cookie scoop to drop dough into powdered sugar mixture. Completely coat with sugar and place on greased cookie sheet. Bake for 8 -10 minutes depending on how hot your oven gets. I usually cook my for 9 minutes. Do not over bake these cookies. Place on cooling rack. Preheat oven to 350 degrees. Beat butter and sugar together until fluffy, add egg and vanilla and mix slightly. Add flour, soda, and salt to butter/ sugar mixture and blend. Add milk and mix well. Use a cookie scoop to drop dough into sugar and coat. Place on greased cookie sheet and bake 8 -10 minutes, I usually cook mine for 9 minutes. Remove from oven and press a chocolate kiss into each cookie. Transfer to a cooling rack. On a side note, check out these measuring spoons! I received these at a wedding a few years ago. Aren't they cute? The inscriptions read: a pinch of patience, a dash of kindness, a spoonful of laughter, and a heap of love.